The Preacher package bristles with contradictions. Why does a group, obsessed with testing itself to well-publicised destruction, make no bones about its cravings for multi-million record sales and long-term American success? What explains theirtransformation? Shouldn't their debut album, Generation Terrorists, be an apocalyptic suicide note instead of a rock record containing carefully wrought hit singles? It seems that in their Welsh exile the Preachers believed too much of what they read in the papers; even as late as the mid-eighties, they became convinced that rock was a crucible for grand ideals and epic gestures. Then they came to London. 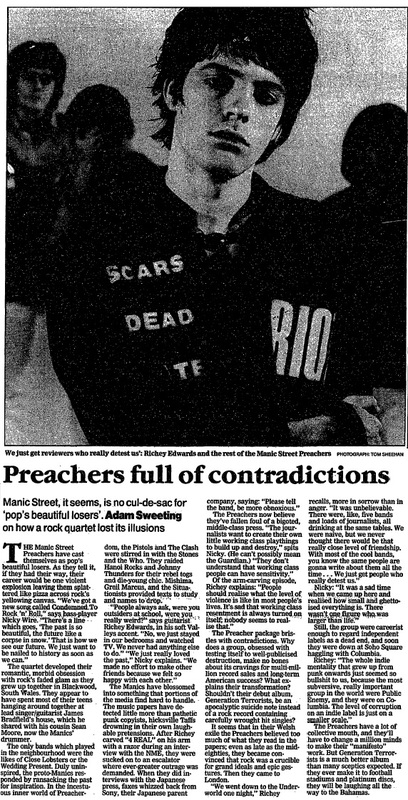 "We went down to the Underworld one night," Richey recalls, more in sorrow than in anger. "It was unbelievable. There were, like, five bands and loads of journalists, all drinking at the same tables. We were naive, but we never thought there would be that really close level of friendship. With most of the cool bands, you know the same people are gonna write about them all the time . . . We just get people who really detest us." This page was last modified on 26 March 2018, at 09:21.